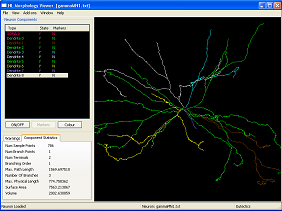 Neuronland provides free software tools for the experimental neuroscience and neuron mathematical modeling communities. Currently, two applications are available, both focused on facilitating the interchange of neuron morphology data between the diverse software packages used within these fields of research, as well as the preservation of such data. Quick download links to binary packages are provided directly on this main page. For more detailed information about a specific application, please visit the corresponding application main page by clicking on the image or the program name below. Both Stable (fully tested) and Development (latest features, but not fully tested) versions are provided. Use Stable versions unless you need the most recently added features or bug fixes. A command line program for converting between 3D neuron morphology formats. Currently 25 formats (50+ variations) are supported, including Neurolucida, SWC, NeuroML, NeuronHOC, Genesis, ImarisHDF, AmiraMesh, NeuroZoom, Eutectics. Various options are available for manipulating the imported data. Current Development Version: 0.10.0.dev January 2016. Current Stable Version: 0.9.0, October 2010. Initial public release: March 2008. A simple user interface built on top of the technology developed for the NLMorphologyConverter. Provides a 3D interactive view of neuron morphology data. Can import and export data in any of the formats supported by the NLMorphologyConverter. Current Development Version: 0.4.0.dev January 2016. Current Stable Version: 0.3.0, October 2010. Initial public release: Febuary 2009.